LONG distance road cyclists have been catered for at this year’s Cream o’ the Croft Mountain Bike Festival (Friday 15 to Sunday 16 June 2018), supported by EventScotland – part of VisitScotland’s Events Directorate. They can look forward to the Breadalbane 160’, a new 160km Audax. Riders of the Breadalbane 160 will head out from the event village at Comrie Croft, Braincroft, Perthshire, at 09.00 on Saturday 16 June 2018 to take on this 100-mile non-competitive, time-limited long distance ride out. An Audax is non-competitive cycle ride, with distances as long as 1400km. Cyclists have a maximum speed and a minimum speed they must adhere to while riding the route. The idea is to complete the miles whilst enjoying the cycling and sense of achievement at the end. Cyclists are self-sufficient, carrying their own repair kit and food. There are no feed stations along the route, as with more competitive cycling events, although organisers must ensure that routes pass places where riders are able to buy food and drink. If this is not possible then refreshments must be provided. Emily Greaves, the organiser of the Breadalbane 160, said: “Cream o’ the Croft will host its first ever Audax next Saturday, the ‘Breadalbane 160’. For the uninitiated, an Audax is a long distance cycling event which uses timed checkpoints along the route. 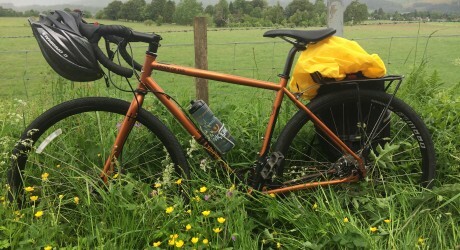 Although short by Audax standards, the ‘Breadalbane 160’ will not be a walk in the park. It will take riders through some of the most stunning scenery Perthshire has to offer. Starting at Comrie Croft the Audax will head West along Loch Earn before turning towards Killin and Glen Lyon described by Sir Walter Scott as the ‘longest, loneliest and loveliest glen in Scotland’. There are loads of landmarks and viewpoints on the Breadalbane 160 route that include Loch Earn and Loch Tay and a superb climb past the Ben Lawers Range over into Glen Lyon. From Amulree cyclists ride through the Sma’ Glen (small glen) which has a great downhill section. In Glen Lyon, riders must also stop at the post office/tea room, a real destination café, to have their cards stamped. They will also stop in Aberfeldy, the last stop to refuel before Glen Quaich. A full route guide is attached. Cream o’ the Croft – ‘Scotland’s Mountain Bike Festival’ – is not only a festival of mountain bike racing for all ages, it is also a music festival with camping and fun activities and a gourmet food and drink festival, all crammed into one unbelievable family-friendly entertainment weekend; and its all within an hour’s drive of Glasgow, Edinburgh, Stirling and Perth. It is a perfect weekend for lovers of the outdoors, both on and off the bike at Comrie Croft, the award-winning green tourism destination, mountain bike trail centre (and onsite bike shop). Audax is a non-profit association where individual event organisers do so out of the love for the sport and as a volunteer. Tickets for the Breadalbane 160 Audax are either £15 (and include a Saturday festival pass) or £35 (and include a weekend festival pass). A camping pass is extra. Please contact Paddy Cuthbert if you would like to arrange to attend either The Cream o’ the Croft for an event feature. Cream o’ the Croft Mountain Bike Festival will be staged at Comrie Croft, Braincroft, by Crieff, Perthshire, Scotland PH7 4JZ – situated between Crieff and Comrie on the A85 – from Friday 15 to Sunday 17 June 2018. For more information about Cream o’ the Croft Mountain Bike Festival and to purchase festival passes and race entries go to https://www.muckmedden.co.uk/our-events/cream-o-the-croft/. All Cream o’ the Croft attendees must have either a festival pass or a race entry. If you’re looking to stay overnight, you also need a camping pass (unless you’ve paid for an accommodation upgrade). A highly entertaining Cream o’ the Croft promotional video, filmed at the venue earlier in the year with the Beast from the East taking a lead role, has recently been released – https://www.youtube.com/watch?v=l-B1zyZUAds. Cream o’ the Croft has always been about showcasing the best locally-sourced food and drink too, so once again Comrie delicatessen Hansen’s Kitchen and Comrie Croft’s own Tea Garden will team up with many of Scotland’s finest food and drinks producers to serve up all manner of delicious locally-sourced edibles over the three days. Title sponsors Black Isle Brewery will ensure beer lovers are well catered for by serving up an assortment of organic craft ales at the bar, to compliment an array of local spirits and fresh juices. The event Velo Village will include stalls and bike related activities for festival goers to participate in and enjoy. There will be lots of ‘non-bikey’ stuff too, for little and big kids alike, with an emphasis on hands-on fun for everyone. Giant Water Slide, Petting Zoo, Bushcraft, Funky Mountain, Circus Workshops, live music and a silent disco, etc. Smoothie Bikes – Make a fruit smoothie using your own pedal power! Magical Fairy Trail – Kids follow clues around the fairy forest to get a prize at the end. The Funky Mountain – For six-plus. Conquer a family friendly obstacle course that has you climbing, crawling and running on all fours, all while being blasted by funky colour powder. An hour of fantastic fun. Nature Stories and Craft Workshop – Sit down for a nature-based story and then venture into the woods to find natural materials to make some of the characters from the book. Adventure Circus Workshops and circus show – Learn circus skills such as ribbons, juggling and trapeze and then marvel at the pros in action! Active Glen Quad Pods – A train of two-wheeled pods, towed behind a Quad bike. Active Glen Segways – Off-road Segway tours around Comrie Croft. Guided Trail/Hill Running – A selection of guided trail runs leaving from Comrie Croft. Steel Band Workshop – Saltire Steel Band (Crieff High School) bring some Caribbean sunshine to COTC by providing live music on the Low Meadow. Learn how to play a steel drum in the steel band workshop sessions! The Bullet Holes (TBC) – Comrie-based country rockers with swag. Banjo Lounge 4 – Old skool hip-hop with a touch of tweed. Colonel Mustard & The Dijon 5 – Colourful, playful, bonkers Scottish headliners! Silent Knights Silent Disco – DJ’s battle on wireless headphones! Those without headphones hear no music, giving the effect of a room full of people dancing to no sound at all! MEDIA RELEASE issued by Littlehouse Media You too can share your stories (aka press or media releases), on this site. Email here for more information. Check out too twitter.com/allSportsPR, twitter.com/allOutdoorsPR and twitter.com/allFestivalsPR.